The film lived up to its promise. It was moving, powerful, and successfully humanized a woman and a family that have been an integral part of Pakistan’s history and political landscape. The strength of Bhutto lies in its ability to capture the personal life and loss of Benazir and the Bhutto family, including her father, former Prime Minister (and President) Zulfikar Ali Bhutto, her brothers Murtaza and Shah Nawaz, her mother Nusrat, and her sister Sanam Bhutto. 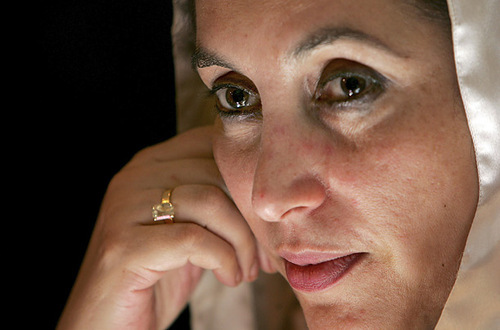 The film includes interviews with a number of analysts of and characters in Benazir’s story, including Sanam Bhutto, Victoria Schofield, Christina Lamb, Reza Aslan, Tariq Ali, Steve Coll, Arianna Huffington, Shuja Nawaz, Akbar Ahmed, Asif Ali Zardari, Peter Galbraith, Mark Siegel, and Benazir Bhutto’s uncle, Ahmad Ispahani. Bhutto was also at times narrated by the voice of Benazir Bhutto, via a never-before-released audiotape, and included moving clips with her children, Bilawal, Bakhtawar, and Asifa. As a result, the Bhutto clan, whose story has often been likened to a Greek tragedy, is unveiled to the audience as characters in a fascinating narrative. 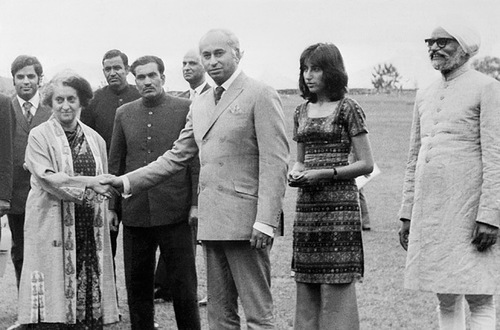 The anecdotes make the family profoundly relatable, and include choice quotes like, “I am not arrogant, I’m intolerant of stupid things,” by Zulfikar Ali Bhutto, and Benazir describing how her father said she “looked like Mussolini” in a newspaper photo of her with Zulfikar Ali Bhutto and Indira Gandhi in 1972. The most powerful part of Bhutto, though, was the lead-up to her death. Every Pakistani experienced the loss of Benazir Bhutto, who was assassinated during a political rally in Rawalpindi, Pakistan on December 27, 2007. Regardless of how you feel about her policies, Bhutto’s death was a tragedy because no other leader shared her conviction or her courage. As her children noted in the film, their mother returned to Pakistan with an air of finality and determination, despite others begging her not to go. For a woman who had already lost so much, her return to Pakistan was her final sacrifice. While Bhutto was therefore a strong portrayal of Benazir Bhutto, the woman, the mother, the daughter, the leader, and the fighter, it was nevertheless a one-sided and subjective treatment of Pakistan’s history, as well as of Benazir Bhutto, the Prime Minister. The film documents Zulfikar Ali Bhutto’s rise to power — the formation of the Pakistan People’s Party as a populist political party with the slogan “Food, Clothing and Shelter” (Roti, Kapra aur Makan), and how he later “swept the polls” in the 1970 elections to become Pakistan’s new leader. Except that’s not exactly what happened. Yes, Zulfikar Ali Bhutto won the majority of seats in West Pakistan. But Mujib ur-Rahman, leader of the Awami League, swept the polls in East Pakistan (what is now Bangladesh), ultimately winning the overall majority in the National Assembly. Bhutto refused to accept these results, and the subsequent denial of East Pakistan’s political rights and autonomy ultimately led to the 1971 war, [see here for my visit to the 1971 War Museum in Dhaka]. The film also glossed over the details regarding this war, focusing more on the Indian intervention (on behalf of East Pakistan), than the atrocities committed against the Bengalis or the later establishment of Bangladesh. The well-known corruption charges associated with Benazir Bhutto’s husband, Asif Ali Zardari, the current President of Pakistan, were also discounted in Bhutto. Instead, the film framed Zardari’s title, “Mister Ten Percent” as part of a PR campaign orchestrated by the Inter-Services Intelligence (ISI). Rather than interviewing well-known and credible voices that could have helped show both sides of the story, Bhutto instead depicts Zardari as a political victim, a portrayal supported further by interviewees in the movie. Bhutto therefore glosses over the snags in Pakistan’s history where Benazir Bhutto could be seen in a negative light and instead focuses on the positive attributes of her life and journey. As a result, the film is more of a hagiography than an honest documentary, immortalizing a courageous woman who held steadfast to the conviction, “Democracy is the best revenge.” While such a portrayal is undoubtedly moving and inspirational, it also fails to scratch the surface of the complexities of Pakistan’s political landscape and society. It falls short of asking the questions of accountability and transparency that Pakistan really needs to move forward. 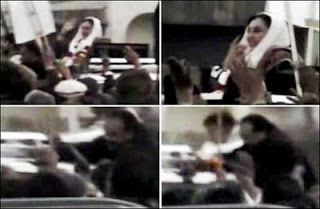 Since Bhutto’s assassination, around 56 audio and video albums focusing on her life and paying tribute to her have appeared in the market. Different companies, like KTN, Marvi production, Jan production, Naz production and Sindh TV, have produced these compilations. Ironically, the CD/DVD release of her last speech delivered at Liaquat Bagh, Rawalpindi, just minutes before her assassination is a major super hit. According to the records of the wholesale dealers at Rainbow center, “Daughter of the East” (an audio/video compilation) has sold more then 3.3 million copies to date. Benazir’s assassination was an immense tragedy for Pakistan, regardless of what your political affiliation or past feelings were towards the former PM. Her death was actually what inspired me to create CHUP. In my first post, written several weeks after Bhutto’s assasination, I noted, “Today, assassinations of former Pakistani leaders are a tragedy not just because of the person or persons involved but because of the moderate voice that was extinguished in the process.” Benazir’s return to the Pakistani political stage last year was without a doubt courageous, not just because she inspired supporters of her own party, but because she did it in the face of militant death threats and daily violence. She did not hide behind the safety of closed doors. She delivered many of her speeches in large rallies that inspired those at the grassroots level. Although this populist approach essentially ended her life [she was shot as she left her political rally], she became a larger-than-life figure after her death, evidenced by the countless numbers of people that have gathered to commemorate her death anniversary. So, today, remember what Benazir Bhutto symbolized – someone not afraid to stand up for her country and for her people, regardless of what forces stood against her. 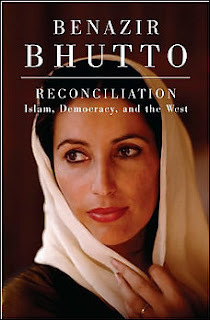 Bhutto Book Launched as "Message from Her Grave"
You can order Benazir’s book on Amazon. On Thursday, Pakistani police arrested two suspects in the suicide attack that killed former PM Benazir Bhutto on December 27th. According to the Associated Press, “Interior Ministry spokesman Javed Iqbal Cheema said the two men were arrested in Rawalpindi… but gave no further details.” Cheema added that he expected the two to appear in “anti-terrorism court” Friday but declined to say whether the two were figures in the assassination. The arrests follow those of two more suspects last month, including a 15 year old who was allegedly part of a suicide squad sent to kill Bhutto, [see CHUP post for January 19]. Details surrounding the arrests are vague and conspiracy theories over who perpetrated the attack are still abound, although U.S. and Pakistani officials assert the assassination was masterminded by Beitullah Mehsud, the elusive leader of the Tehreek-e-Taliban, the umbrella organization of Taliban-linked militants that have been battling Pakistani security forces near the Afghan border. Yesterday, news sources reported that the Tehreek-e-Taliban declared an indefinite ceasefire in this fighting, although the Pakistani military spokesman denied knowledge of such a development, [see yesterday’s post for more information]. Today, however, media outlets did note that the government was preparing for peace talks with the militants. According to Pakistan’s The News, the development will likely be “greeted with skepticism by the United States and Pakistan’s other Western allies, who believe Islamic militants exploited a failed truce last year to expand their reach into this turbulent, nuclear-armed country.” The Daily Times reported that the military spokesman, Maj. Gen. Athar Abbas, warned that this declaration of a ceasefire by militants “could be a move to regroup for another attack.”Abbas’s assessment was echoed by a piece in the Christian Science Monitor today, which called the development “curious,” adding it further highlighted “the confusion in Pakistan’s tribal areas.” According to the Monitor, “It appears that the militants in the tribal belt are maneuvering for time and space. Taliban leader Mullah Omar has recently been trying to turn the Taliban’s attentions toward Afghanistan, not Pakistan. This cease-fire claim could represent an effort to call off Pakistan operations so that the Taliban can refocus and regroup.” Ahmed Rashid, the author of Taliban [a book, which if you haven’t already read, you really should] told the news outlet, “In the past, these cease-fires have resulted in militants being able to bide more time, build up resources, and then make much more effective attacks.” Any solution, Rashid noted, must include restoring moderate tribal chiefs to power, many of whom have fled to Peshawar or Lahore amid the escalating violence and growing Taliban presence. If these leaders don’t return, he said, “you are leaving the region in the hands of these militants.” The military must also integrate FATA [Federally Administered Tribal Areas] into Pakistan in order to reduce the current power vacuum that has allowed to region to be susceptible to extremist influence. Given the recent reported developments related to U.S. training and aid to Pakistan, I would be curious to know how Pakistanis in the FATA react to even this reportedly small amount of U.S. presence, given the anti-American sentiment on the ground. In an area plagued by violence, could this influence be depicted in a positive light? Could the Pakistani military do more to aid perceptions in that regard? Note: the Council on Foreign Relations released an interesting interview with Ashley Tellis on the security situation in Pakistan, as well as a good backgrounder on the various militant groups in the country, [thanks Jessica!]. Image courtesy of the AFP. However, will this new development and Zardari’s forefront role in the party impact voters’ perceptions of the PPP? 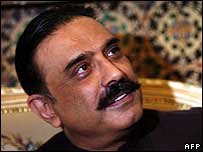 According to a profile released by BBC News, Zardari has been seen as a political liability for his late wife’s party. Widely known in Pakistan as “Mr. 10%,” his corruption charges and alleged link to the murder of his brother-in-law Murtaza Bhutto in 1996, have seemingly haunted his reputation. However, even when he first married Benazir, Zardari apparently knew he was the “designated fall guy,” a title he reportedly accepted, according to the BBC. Will this title come to haunt the party now before election time? Have perceptions of Zardari changed since Benazir’s assassination? 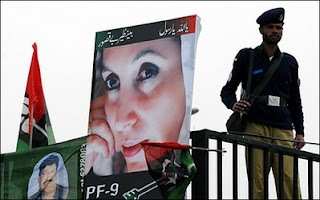 In yet another twist to the unfathomable Bhutto assassination: news sources reported this morning that the Pakistani police has arrested a teenager who was allegedly part of a five-man squad in the plot to kill the former PM last month. According to the AFP news agency, “The suspect, 15-year-old Aitezaz Shah, was arrested from the northwestern city of Dera Ismail Khan on Friday while planning a suicide bombing during Ashoura.” The Associated Press cited an intelligence official, who said “the 15-year-old told investigators that the five-person squad was dispatched to Rawalpindi, where Bhutto was killed, by Baitullah Mehsud.” Newswires cited Interior Ministry spokesman Iqbal Cheema who stated he had not received information about any arrests, or about any new developments in the Bhutto case. The development further supports previous government allegations that Mehsud and Al Qaeda-linked militants were behind the assassination. However, what’s interesting is whether the recent news – the CIA announcement and the arrest of a teen who allegedly confessed to the crime – changes perceptions about who killed Bhutto. Although the majority of people in the sidebar poll affirm that AQ was behind the assassination, a significant portion of those polled, as well as those surveyed in the recent Gallup Pakistan poll, suspect that government agencies were complicit in the attack. So here’s a question – does this change your mind? Or are you still a skeptic?